Milk Procurement System is the key factor behind the success of Sursagar dairy. We at Sursagar Dairy are committed to provide fresh milk. High quality of milk is procured directly from the farmers at village level. To eliminate middleman, we have established a network of more than 120,000 farmers in villages, 750 village level collection centre(VLCC), connected with 4 milk chilling centers (MCC) . We procure milk both morning and evening shift. To maintain freshness and quality of milk we quickly bring this milk to nearest concerned MCC,get it chilled and stored at below 4'C.Finally milk is transferred to process plant for its processing. The dairy has created integrated cold chain facilities from producer to consumer to ensure the freshness of the milk at all stages. The dairy has a team of Veterinary supporting staff to educate the farmers on Animal Health Care and clean milk production. This has enabled the farmer community to produce good quality milk. The dairy has high regard among the milk producers for its fair price policy and prompts payments. The trained field staff working on the front end is the core strength of the dairy. To enable milk procurement directly from the farmers, we select our village service provider (VSP) after the recommendation of group of farmers of respected villages. After giving proper training to VSP, we install automatic milk collection unit (AMCU). At VLCC every farmer’s milk is tested for its quality Fat/Snf. The milk rate per litre is calculated on the basis of quantity, Fat and Snf. Each farmer is allocated a unique code number. When milk purchase transaction is done, printed slip to the each farmer mentioning all the detail of said transaction with amount of milk poured is given. We operate more than 150 milk procurement routes (milk van).These routes have a regular route plan and it follows a pre-decided time table to pick up milk can from village in both morning and evening shift. The details of all milk procured and its transaction record for each farmer is recorded and uploaded in software at the MCC for preparing milk payment to the farmers. Farmer brings the milk to the collection center who is provided with a card. The milk is weighed with an electric scale and weight in grams is converted to liters. The data will be captured in the system. The dairy has established stringent quality control measures right from the milk collection level at village to the consumers at urban level. To maintain & control the reasonable standards of the production, to maintain the quality in the procurement & the processing of the milk. 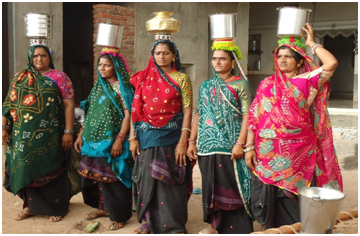 To make milk as per international standards, milk having high quality need to be procured right from the village level; so Union has commenced "Bulk Milk Cooler(BMC)" having different capacities to facilitate chilling at the place of production, Which has helped to improve quality of milk; and, milk of two three times can be brought by single trip as per suitability of time, and also society can collect milk at their desired time and preserve milk by chilling. Immediate cooling of the milk leads to stop the growth of the micro organism. So, dairy gets about 70% of milk having MBRT of 2 - 3 hours due to which we could be able to supply high quality milk in the market. Automatic Milk Collection Unit (AMCU) plays a vital role in procuring fresh and clean milk with transparency with our farmer at village level. AMCU enables getting quick result of Fat/Snf/quality and also computer transaction slip showing all detail of milk poured by the farmer at our collection centre. AMCU consists of Eco Analyzer, Data Processing Unit, Electronic Weighing Scale and Printer with power back up. Eco Analyzer gives result of Fat & Snf % contains in the milk within 30 second, Data Processing Unit calculate the amount of milk poured by farmer by capturing Fat/ Snf from Eco Analyzer and weight from Electronic weighing machine and give command to printer for printed transaction slip. The purpose of this AMCU is to achieve timely, accurate and transparent milk collection with best use of information technology. It has resulted into reduction of waiting time, decrease in wastage of milk, elimination of unfair practice. It provides a simple, automatic, fast and accurate solution for all the record keeping, billing and reporting activities related to milk collection at the primary level. If raw material has good quality, then finished product will have “the best” quality. 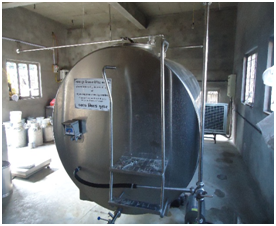 A Milk Chilling Centre (MCC) covers normally up to 50 village level collection centre (VLCC) in the territory up to 40 kms.we have four Milk Chilling Center at Wadhwan,Chotila,Halvadand ,Patdi To maintain freshness and natural quality of milk, we get milk chilled at below 40c within 2 to 3 hrs of milking. After picking milk cans from allotted VLCC, milk vehicle arrives at allocated MCC according to its time slab. At MCC, milk is tested for all the parameters. Once all the tests are complete and milk suitability is confirmed to meet our international quality norms, it is chilled; and is then sent to main processing plant for processing. Milk is a raw material, and from it milk, and milk products like Ghee, Powder, Butter, Paneer, Curd, Buttermilk, sweets etc are being manufactured. Quality of all products depends on process and raw material If raw material has good quality, then finished product will have “the best” quality. Milk is one food commodity and there can be adverse effect on its quality if proper care is not taken during production, procurement and transit. Strategy like cleanliness of milch animals, healthy animal, cattle care and personal hygiene of milking person, cleanliness of milking place and cattle-shed, cleanliness of milking vessel and utensils of milk collection at the society, and, responsibility lies with producers for speedy and time bound follow-ups of all activities right from the point of milk production by milch-animals. Whereas responsibility of cleanliness of milk collection point, cleanliness of milk utensils, cleanliness of BCU centre and maintain timely and careful transit of milk to the Union/chilling centre lies with directors of the society. The processing of milk at the Union becomes speedy and easy due to good quality milk, thus quality milk and milk products can be supplied to customers. As milk is the best food for us likewise it is also best food for micro organisms. They multiply very fast in the milk & spoil the milk quality within a short period. Contamination & growth of microorganism in milk can be controlled by getting knowledge by members regarding CMP. To encourage clean milk production Sumul had started to give 10 paise per litre to the milk having 15 lac or less bacterial load & 5 paise per litre to the milk having 16 — 30 lac bacterial load all depends on the number of bacterial load found in the milk transit from BCU to union from July; 07. To improve more quality of the milk depends on number of bacteria 20 paise per litre or 10 paise per litre being given since October, 2013 to encourage.